As early as in the years 600 in China, loose leaf tea, including green tea, black tea, white tea, and oolong tea, was wrapped in folded paper, then sewn to keep the flavor. It is only in the early 1900’s that tea bags became commercially available. A famous tea merchant from New York was shipping his tea everywhere around the globe, and his tea leaves were wrapped into hand sewn fabric bags. The leaves were supposed to be removed from the bag before steeping, but the customers found it more convenient to steep the tea with the tea leaves still in the fabric bag. With a fast paced life, this tradition became more popular in the twentieth century, to the point where loose leaf tea became almost marginal. The industrial tea producers invaded the market with low quality, mass-produced tea bags, and loose leaves lost their visibility. For many, the ritual of tea involves the simple dunking of a tea bag in a cup of hot water. However, for an increasing number of people, only high quality loose leaf teas and tea blends will be considered, with the proper preparation it entails, for a number of reasons. Though the content of a tea bag supposedly comes from the same plant, camellia sinensis, there is certainly a difference in quality. Loose tea contains the whole tea leaves, which are carefully hand-picked, only harvesting from the plant the youngest leaves from the branch, usually the last two at the tip of the branch. The tea leaves harvested by industrial producers, on the other hand, are not harvested so carefully, and stems are often present, affecting the taste (and the weight). Tea bags are filled with mostly tea dust and small fanning. In terms of taste, one can easily understand why the loose leaf tea will provide a more complete spectrum of flavors, whereas tea bags will infuse the limited flavors available from broken leaves, plant particles and tea dust. The standard tea bags are made up of low quality material, which undergoes various chemical procedures. These chemicals, when released while brewing, add a bitter taste and pungent aroma to the tea. Set aside the taste, the ubiquitous tea bags are put to shame by the health benefits of loose leaf tea. After sitting in a warehouse for months, or years, tea bags spend an impressive amount of time on a shelf waiting for a customer. During all that time, the health benefits of tea slowly fade away, offering about 5% of the antioxidant power compared to fresh loose leaf tea. The loose leaf teas when brewed allow its fully dried tea leaves to expand and release the nutrients, color and aroma, while the tea present in tea bags is a mixture of tea dust and broken tea leaves. There is simply not enough room to expand and release the nutrients. In terms of price, as goes the old saying, if you pay peanuts you get monkeys. Tea bags may cost less than all natural, fresh loose leaf tea, however the taste and the health benefits are left behind. Priced per cup, loose leaf tea costs less than $0.25, a sound investment for your health, and neglectable amount of money when compared to a latte in your neighbouring coffee shop. 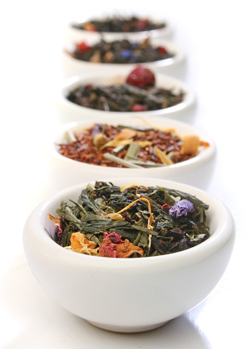 At The Tea Company, we offer a wide selection of the freshest, all natural loose leaf teas. Have you found your favorite yet?